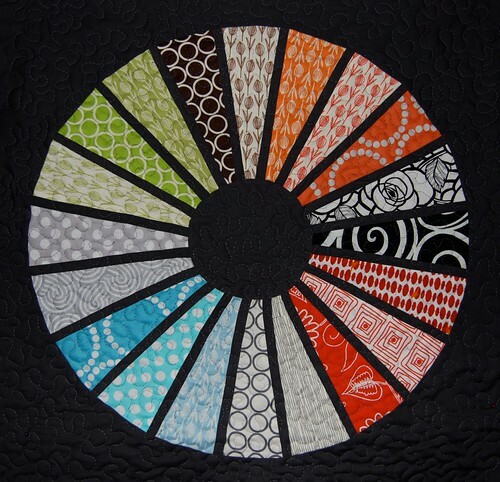 A mini QAL quilt, originally uploaded by Lynne @ Lilys Quilts. I couldn't resist having a little play with the Sew Fresh Lily's Quilts Blender Bundle. I made this version of my QAL quilt using my dresden ruler to cut the dresden leaves then adding 1/2" strips in between each one. I can't decide whether to make it into a square or a circular quilt. Ummm I think it will be gorgeous regardless. It already is! Make it a circle then you can put it on the floor, stand on it and shout 'Beam Me Up Scotty'! (It's flipping lovely by the way!). Oooh, I really like it. I think I have almost all those fabrics, although not in each colorway. Love the colors! I like the circular quilt idea. I'd use it as a medallion in the center of a large square quilt, because I love medallion quilts and have no use for small circular quilts. Dang it! Now I want one just like this!! It looks fabulous, and I think I have most of those fabrics already, yay! I see a nice circular sit upon cushion! stunning. Love the way the black shows off the fabrics! I love how the black makes the whole design pop! I agree that the black really showcases the colours but I LOVE the circle/square thing - sort of creates tension between the two strong shapes! This is just wonderful!!! I'd go with the circle quilt!! I have a thing for circles what can I say!! It almost looks like a stained glass window.